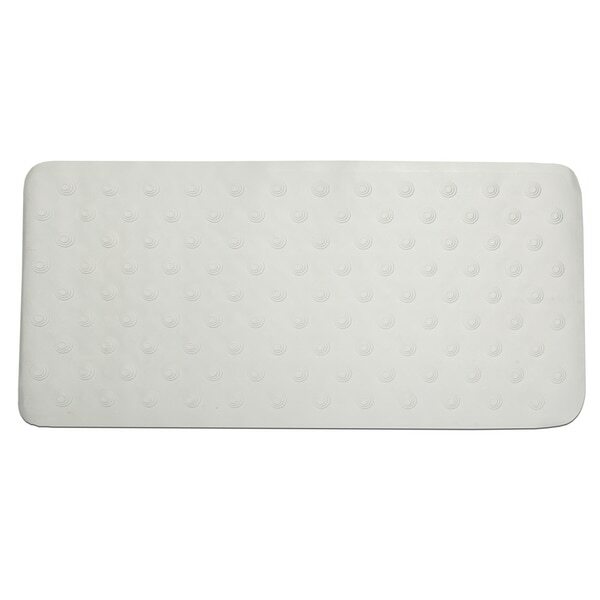 Add a touch of safety to your bathtub or hot tub with this rubber bath mat. Simply moisten your bathtub floor and firmly press all suction cups in place for secure, anti-slip protection. The plush rubber construction is gentle underfoot and offers a comfortable standing surface. Perfect for lining my long tub. I replaced a mat with this one. It is comfortable to stand on. I have an old Roman Tub shower/bathtub made out of tile (pop cycle orange with brown grout) that was reglazed off white. It is slick when wet and the size is much bigger than a normal tub. This is one of the longest mats I have found. It works well and doesn't slip. The quality is fine, but WOW is this big. It is a bit too large for my standard sized tub. Because of it's large size, it retains a lot of water after your shower. When you remove it and shake out the water after a shower, at least a cup of retained water drains out. It would be very easy for this to mildew if you don't shake out the water after each shower. There are not sufficient drainage hole for it to dry on it's own. Update: I took the advice of another reviewer and cut this bath mat down to a smaller size. It now retains much less water and is easier to maneuver in the tub. It was easy to cut and it actually retains the shape better now too. Before I cut it, it was curling up on one end and would not lie flat. Now it lies perfectly flat in the tub. It is the entire length of our bathtub and it does not slip at all! It is perfect! I needed this extra large in size mat to use on a large marble shower floor to help prevent another fall until I can change out the slippery marble with different tile. This has great suction and plenty of holes to help the water drain through. Most of all, the texture of it, with smaller and larger bumps to help your feet grip and feel grounded. This is definitely superior to another similar mat I purchased at a local domestics chain store. Substantial weight - we shall see how long it lasts and resists mildew, since it serves its purpose well for now. I bought a claw foot bath tub in a larger size to accommodate my husband. Unfortunately, I slide in the tub. I bought a smaller bath mat to help, but the mat slid also. This one because it is larger does a much better job holding me in place. You can feel the bottom, but it works, and now I can safely take a bath and relax. I really like this bath mat because it is extra long. I would have liked it maybe in a darker color, but this will work fine. It really grabs the tub and is comfortable. Absolutely the best surface texture for non-slip plus long enough for older and new tub even curved bottoms. It is very hard to find a jumbo size mat. This mat covers the entire bottom of our tub. Love it. I bought this mat to put in a very slippery tub and it works great. The only issue I have is that when it was packaged it was rolled in a tube shape and I can't seem to get it to relax and lay flat in my tub. I've used it 5 or 6 times and the end is still curled up and it doesn't want to stay suctioned to the bottom of the tub. I'm hoping it will relax with time but for right now, it's a little difficult to use. Great quality and the largest mat that I could find for my shower stall. It is very comfortable on the feet and I would recommend to a friend. I was worried about suction on textured tub. It works great and covers well. Great suction meaning much less slippage, if any. Very happy with mat. Ordered for a larger tub and it fits just the way I wanted. Arrived early and was packaged securely. "Is it lumpy if are laying in the tub? How thick is the mat?" It has suction cups to hold it in place so it would probably feel a little lumpy to lay on. The mat is slightly thicker than an average mat, however we don't have an exact measurement. "Is this treated with anti-bacterial or anti-mildew agents?" Hello tcat, yes this is anti mildew. If you have any other questions please let us know. Have a great day! I want this for added safety.